The Queen of Puddings: A GIVEAWAY that comes up smelling of roses! A GIVEAWAY that comes up smelling of roses! 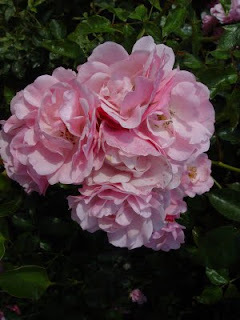 I have filled our garden with roses, light and dark pink,yellow, white... and even a rather odd lavender coloured one! But I don't celebrate them just for their visual beauty, or even their scent... but for their flavour. If you haven't discovered roses as edible magic then follow me on Pinterest and check out my board on edible flower delights! My son makes a divine rose petal lemonade. This summer I have been living off my own fairy flower tea of fresh lemon balm, rose geranium leaf and rose petals... and my favourite chocolates are... yup, you guessed it, rose creams! Ha! I've just realised that my tea pot and tea cups and chintzy plates are all covered in roses too... ooops this is becoming a little obsessive! I want to share my passion for roses with you in person, and offer you the chance to win a pair of tickets, to a very special event at the inaugral Ballymaloe Garden Festival in East Cork, Ireland. Bring a friend to hear award winning gardener, Helen Dillon, of The Dillon Garden in Dublin, & Rory O’Connell ex-head chef of Ballymaloe House for a sensual celebration of roses. Helen will talk about growing roses and Rory will talk about the many wonderful uses of roses in the kitchen. It's on Saturday August 31st from 11.30am to 12.45pm in The Grainstore, Ballymaloe House. You will also get to meet The Queen of Puddings in the flesh - that'd be me - I'll be wearing a pink rose in my lapel!!!! The Ballymaloe Garden Festival is dedicated to sustainable gardening, and features names like Alys Fowler, Michael Kelly, Joy Larkcom and Darina Allen who will be joined by experts on rare plants to garden design, wetland systems, urban gardening, herbal medicine, through to flower arranging and watercolour painting. There will be a family friendly fringe festival of fun and food, plant stalls, and free guided tours around the Ballymaloe Cookery School Gardens. Tickets for individual events are available at the doors on the day, and day passes can be purchased from The Grainstore. Click for a complete programme of events. 3) Leave a comment here or on FB to let me know you've shared. The winner will be announced next Thursday, 22nd August by midday (BST). I will give you the tickets in person at the event! Good luck! Thank you for all the entries on the Facebook page too.